Rescuing animals is a hugely rewarding, yet challenging, experience. We can not save any of these dogs without your help. There are many ways for you to offer your assistance to Gimme Shelter….we are always in need of support! Our ability to rescue dogs depends entirely on the donations we receive. With your compassion and generosity, we can continue our mission of saving lives! We pride ourselves on making sure that each and every dog receives the proper medical care before he/she is placed for adoption. Every dollar you donate is tax deductible and goes directly toward saving the life of an animal! Our fostering program is unique in that each dog lives with a foster prior to adoption. This enables us to assess the needs and personality of each individual dog, and every foster home represents a life we can save from a kill shelter. 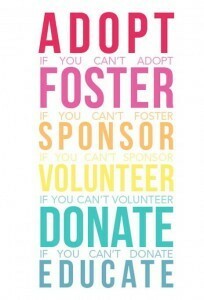 Fostering is an extremely rewarding experience. Please open your heart and your home to one of our rescued furry friends, and give them the time and opportunity they need to find a forever home. We are a volunteer based rescue organization. We rely on volunteers to help with adoption events, transports, and fundraising. If you have a few hours to spare and want to help us save lives, you will find this experience truly rewarding.